Crazy over priced! Even if it was turbo back its pricey. But £3.5k for a backbox is ludicrous. I had this on my estate R. Was rather annoying. I scanned mine with VCDS and it was showing as a steering wheel malfunction but as you said it traced back to the DSG selector, the message was 'selector lever park position lock switch'. Mine only had 9k on it at the time. Are you in warranty? The White Goddess has arrived..!! Thats me. I had a 3 door in Lapiz and now a Estate in the same colour. I personally prefer the estate over the hatch. I live in the waterside, so not far from Donnelly. Are you in the city? Lovely car Gary. I didn't realise your from Northern Ireland. I am awaiting my 3rd Golf R, which is also coming into the same dealer. I seen yours and thought it was mine for a split second last week :-) Where are you based? Would you EVER consider rep prets? 100% shouldn't be under warranty. He mis-shifted, caused the damage. There is no other way to cause an over rev other than user error. Probably why VW put that feature into the ECU. To stop them having to pay out on fraudulent warranty claims. Broken Driver Mirror £420 to Replace ??? Are the mirrors R specific? 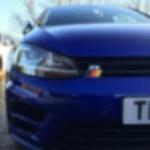 Or could you just buy a second hand generic MK7 Golf mirror off the likes of ebay and source a R mirror cap for it?